An assessment of ten priority road accident black spots was carried out by Northern Corridor Transit and Transport Coordination Authority (NCTTCA), Kenya National Highway Authority (KeNHA), National Transport and Safety Agency (NTSA), Kenya Transporters Association (KTA) and Kenya Traffic Police from the 4th to 8th of March 2019 along the Northern Corridor routes from Mombasa to Kisumu. The aim of the survey was to identify, diagnose and address issues that lead to rampant loss of lives in the road accidents along the corridor. 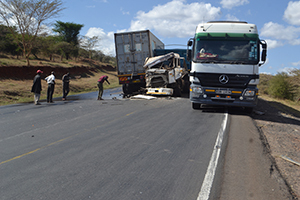 An assessment of ten priority road accident blackspots was carried out by Northern Corridor Transit and Transport Coordination Authority (NCTTCA), Kenya National Highway Authority (KeNHA), National Transport and Safety Agency (NTSA), Kenya Transporters Association (KTA) and Kenya Traffic Police from the 4th to 8th of March 2019 along the Northern Corridor routes from Mombasa to Kisumu. The aim of the survey was to identify, diagnose and address issues that lead to rampant loss of lives in the road accidents along the corridor. “The exercise was an implementation of the Northern Corridor Executive Committee’s directive on ‘Improvement of safety in all transport modes’ and facilitation of safer transport across the Member States. 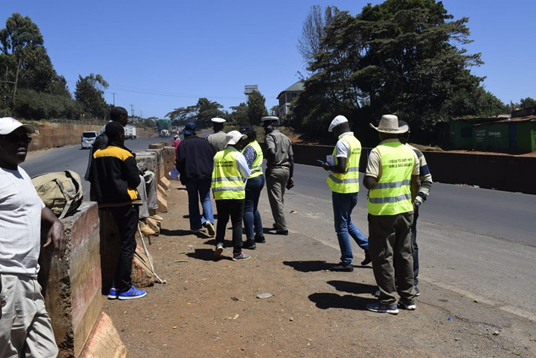 The Permanent Secretariat therefore brought together key road safety stakeholders in Kenya to carry out a joint survey of ten (10) priority black spots along the Northern Corridor routes in Kenya”, revealed OMAE NYARANDI, the Executive Secretary of Northern Corridor Secretariat. 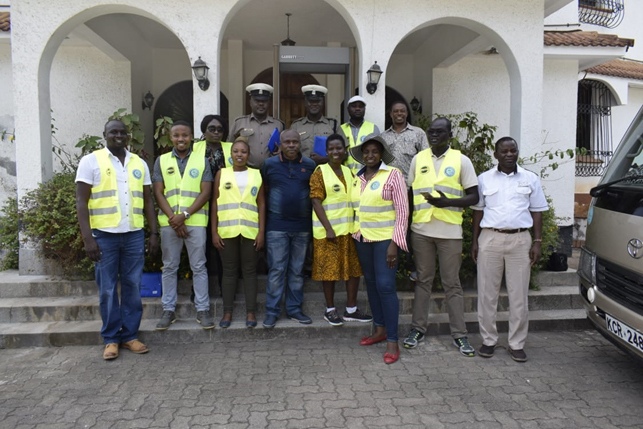 Black spots survey team at NCTTCA Headquarters after being commissioned by OMAE NYARANDI, the NCTTCA Executive Secretary, on 4th March 2019. In road safety management, an accident Black Spot or a Black Spot is a place where road traffic accidents have historically been concentrated. According to Police Traffic Reports in Kenya, Black Spots are known to be the locations or stretches where most road accidents that claim large numbers of human lives occur repeatedly with more than five crashes recorded annually. The 2015 Global Road Safety Status Report by the World Health Organisation shows that Kenyan roads are amongst the most dangerous in the world; claiming an average of 29.1 lives per 100,000 people. The same report revealed that road crashes are among the top ten killers of Kenyans and account for between 45 and 60 percent of all admissions to surgical wards that cost the country up to 5 percent of GDP. According to the National Transport and Safety Authority (NTSA) data, 9,030 people had lost their lives on the Northern Corridor road network in Kenya in the last three years (2016: 2,965; 2017:2,919; and 2018: 3,146); pedestrians being the most prone to road carnage where in 2018 alone, 1,201 persons died. The same NTSA data revealed that 8,272 people were injured in 2018. This was an increase from the 2017 figure in which 6,789 people were injured. In January 2019, road accidents have claimed more lives of Kenyans than in the festive month of December 2018, a scenario that may easily be attributed to the relaxed mood in creating awareness on road safety during January. According to the survey results released by NTSA on 25 January 2019, 184 people have lost their lives on the roads since the year 2019 began. Accident that involved two trucks at Salama-Sultan Hamud black spot on Mlima Kiu on 14th March 2019. The main reasons for accidents are varied: 92 per cent of these accidents are caused by human error, with mechanical problems accounting for five per cent, while environmental issues are to blame for three per cent of the occurrences. “In Kenya, the National Transport and Safety Authority road crash statistics show that, on average, 3,000 lives are lost annually and thousands more are injured. This sad state of affairs can be avoided if the root causes of road traffic crashes are addressed”, recalled NYARANDI. He added: “Road Safety has become a major challenge for our Corridor albeit tremendous efforts made in the development and improvement of transport infrastructure within the Northern Corridor”. Assessment of Gitaru-Rungi black spot, a 2.7 km stretch where 117 crashes, carried out by the Joint Survey Team on A104 highway. Advocate for funds mobilization in order to address safety concerns at priority black spots identified in Kenya. Among the ten priority black spots, three were assessed in the Coastal region namely: Kibarani- Makupa Causeway, Bonje and Maji Ya Chumvi; followed by other three (3) black spots at Emali-Pipeline, Ngokomi-Kalimbini and Konza-Malili; in the Eastern region while two (2) black spots were assessed at Mlolongo and Gitaru-Rungiri in Nairobi before assessing one (1) black spot in Rift valley at Mukinya-Migaa-Sobea-Salgaa-Sachangwan and concluded with the last black spot in Kisumu at Molem-Nambaokana-Nyamasaria-Kasagam. Over speeding/Overtaking: it was evident that there is tendency of vehicles to over speed and overtake dangerously with risk of head-on, rear-end, side-impact, side-swipe, roll-over and multi-vehicle pile-ups collisions that call for sensitization programs and driver training. Unsafe junction/access layout: Some major junctions are not well channelled from the main highways with faded road marking and other existence of ambiguous road marking confusing road users in addition to junctions located on horizontal/vertical curves with limited visibility splay. Obstruction by trucks, PSV parking by road side: some trucks park on shoulders while designated bus bays are on edge of carriageway while PSVs pick and drop on road edges. Expediting the implementation of the Road Side Stations program is one of the mitigation measures as its main objective is to create rest stops, create well organized and safe parking while promoting safety. Vendors selling their wares by the road side/Encroachment into road reserve: vendors and local communities along the highways stand in the middle of the carriageway to sell their goods to moving traffic posing great danger unto themselves and other road users. Lack of designated pedestrian crossing points and NMT facilities: Lack of marked pedestrian crossings and walkways are forcing pedestrian to cross anywhere and walk on road edge oblivious of their safety. Existence of numerous accesses and illegal turnings to business establishments: There exist several business establishments on both sides of highway. These businesses have direct access into and out of the road with no standard speed change lanes. “The commissioned survey on 10 priority black spots was phase one of a broad programme of enforcing effective road user behaviour, road system design and traffic management to mitigate the identified deficiencies along the Northern Corridor road networks”, concludes OMAE NYARANDI. The programme will contribute to the 4th EAC Development Strategy that aims at harmonizing with the African road safety performance target which is to reduce the Road related fatalities by 50% by 2020.